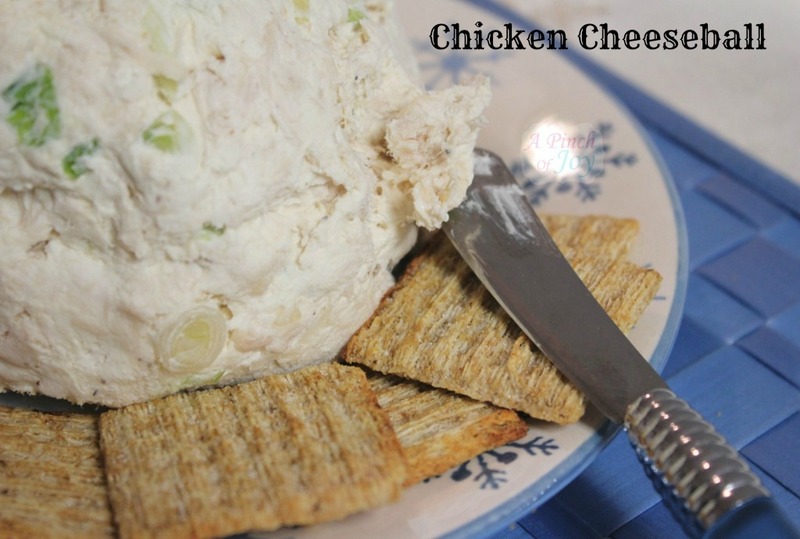 Chicken Cheese Ball is a highly evolved recipe. Or so one would think looking at the notes I have made on this recipe. I think you will agree it was worth the persistence! It started out with 4 packages of cream cheese. Well and good for a crowd. But usually what I want is enough for 10-20 for one event. So I decided to halve the recipe once upon a long ago. Okay, two packages of cream cheese – 8 ounces each – one fat free and one regular just to cover all the bases. Later, I needed to know how much chicken was in two chicken breasts because I didn’t have whole breasts. I had chicken breast tenders instead. I got google involved and noted a measurement that is heavily marked out. Another note says “1 chicken breast equals 6 ounces” (apparently google again) and 12 oz cooked chicken equals just over 2 cups finely diced chicken (from my own experiment just after I purchased a scale). The “add salt, pepper and garlic salt to taste” was so imprecise I usually overlooked it. So it became a teaspoon of salt and one half teaspoon pepper and the change to garlic powder ½ teaspoon was also made. You can add more to taste. I also like to add about a teaspoon of garlic herb mix like McCormick Perfect Pinch. There were no mixing directions either. If you make a 4 packages of cream cheese batch, plan to use a heavy mixer! A 2 cream cheese batch can be mixed by hand, but a mixer distributes the ingredients more easily and evenly in the finished product. The smaller you cut the chicken, the easier it is to mix. If I am making this for use at home, the guys like it on the chunky side, but if I am taking it somewhere, I usually mix until somewhat smoother. Make this ahead of time so the flavors have time to develop – overnight is best. Make Chicken Cheeseball ahead to let the flavors meld for a delightful and healthy spread for the appetizer table. Cook chicken, saving broth for another use. Cool, then shred and chop into very small pieces. Put chicken in mixing bowl and add remaining ingredients. Mix well, using a heavy mixer. Add additional seasoning to your taste, if needed. Refrigerate for several hours, overnight is best. Shape into ball before placing on serving platter. Can also use as spread or filling for canape. Makes one large cheese ball, about 4 inches in diameter.